We are a medium-sized company in Barchfeld in the State of Thuringia and have a metal processing tradition that has lasted for more than 100 years. Our focus is the rational production of stamping and bending parts as well as plastics and metal mould making. With more than 100 employees and state of the art machines, we are one of the most powerful suppliers in this area. We are a one-stop-shop for stamping and bending technology and are fully self-sufficient in all our areas of activity. Design, tool and mould making, plastic injection moulding with mould making for metal components are just part of the services we offer, as are part and component assembly. 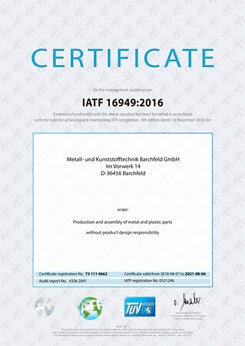 The basis for a successful cooperation with our customers is a quality management system, whose functionality is supported by current certifications according to IATF 16949: 2016 and DIN EN ISO 14001: 2015 for the Manufacturing and Assembly of Metal and Plastic Parts, as well as the certifications according to ISO 9001: 2015 for the Production of Metal and Plastic Products, Stamping, Forming and Injection Molding Tools. In order to safeguard this competence and capability, but also to expand it further, our qualified employees and partners constantly understand and apply proven and new methods for ensuring quality and all processes. We bring the right people and skills for every project together. We accompany and support our customers as Full-Service-Partner through pre-material competence, own toolmaking, equipment and prototype construction, small series and high volume production. Openness to the new and with the curiosity of the researcher, we think visionary and far beyond the existing - because nothing is so good that we could not optimize it yet. Our flexible machinery with a multitude of modern, automatic stamping and bending machines with press forces ranging from 400 to 5000 Kilonewton is flexible and suitable for all batch sizes. In addition to the production of our stamping and bending parts and the plastic mould injection, we also offer assembly services for parts and component assemblies of every complexity.